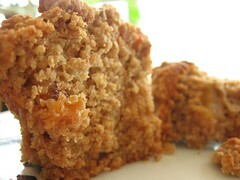 Oat Bran Muffins with Dried Pears - Do You Know The Muffin Man? Notes: I made a few subs: pineapple juice for cider, and yogurt (Danone Activia pear) for buttermilk. Most oat bran muffins tend to be really crumbly and dry. Sadly, this one was no exception. It's made with egg whites and only a few tablespoons of oil, so the low fat content makes this taste like a “healthy” muffin. But, to Schneider's credit, it's flavourful and I like the two kinds of pears, both dried and fresh (from the yogurt).